Get the BAND the biggest rock stars, sports stars, celebrities and the Fortune 500 hire, endorse and trust to maximize their events potential and take it to another level. 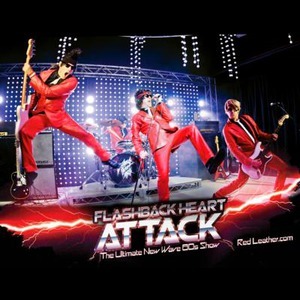 Nobody does it better than Flashback Heart Attack!! Internationally touring and headlining events across the country. Look at the pictures, video, testimonials and the celebrities that endorse them all on their website. What it's not is corny. It's not a bunch of old guys shopping at Forever 41 trying to look "80s." It's three good looking guys and a drummer giving you a high energy 80s show that is endorsed by multi platinum rock stars. Their performances are so spot on, Flashback has been the band used to back singers of 80s bands like Berlin's Terri Nunn, Annabella from Bow Wow Wow, Dale Bozzio from Missing Persons, A Flock of Seagulls Mike Score, Tommy TuTone, John Easdale of Dramarama, Naked Eyes, REO Speedwagon, The Romantics, Clive of When in Rome, All those lead singers have hired Flashback Heart Attack to be their backing band. That's the highest level and ultimate compliment. We pass all this experience on to your event. Singer songwriter Linda Perry called Flashback "Band to the Stars!" She would be right. Playing the wedding of the 4 Non Blondes lead singer to Sara Gilbert and playing mega band Green Day Tre Cools wedding would be a start. Playing Las Vegas with Maroon5 5 and a Palms residency following, Flashback is a Vegas quality show ready to take your event to the next level. You want the absolute best for your corporate event, wedding, birthday party, fundraiser, charity event, night club and high end engagements. They are all very important to us as well and there is a premium on making every event unique with high energy entertainment resulting in a exciting and memorable evening. Flashback is hired by those that expect that level of talent and entertainment factor for their important events making every event major a success. 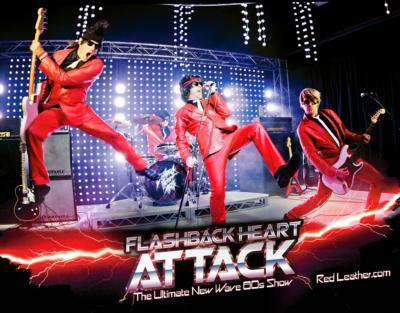 Flashback has been hired and called the "real deal" by multi - platinum rock stars like Billie Joe Armstrong of Green Day and drummer Taylor Hawkins of the Foo Fighters. "It's just a different level." Look at the body of work, clientele that hires the band, photos, videos, the venues that invite the band to play. Flashback has traveled internationally from Canada to Cabo San Lucas, California to New York and all over the United States entertaining. Flashback LOOKS like an authentic band from the 80s. They didn't play in karate outfits, pajamas or tight shorts. That's what your guests should dress like. Not your entertainment. Your event is important. Treat it so. New Years Eve with Maroon5 at Palms Las Vegas. 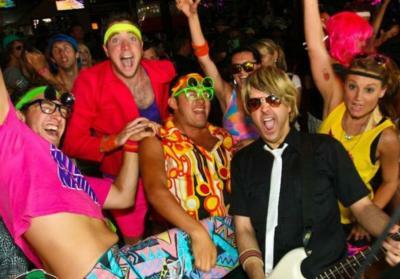 You're looking for high energy 80s entertainment to keep your crowd fully engaged. You want an amazing event with a packed dance floor that your party will talk about well after the event is over. We can make that happen. For other booking information contact from our website or give us a call. Can also put packages together with stage, lighting, DJ etc. No show too big or small. Let us know what you have in mind. Give us a call and we'll work with you step by step to make sure its the best event possible. Please note Flashback Heart Attack will also travel to Alhambra, Bell Gardens, Glendale, Huntington Park, Maywood, Monterey Park, Bell, Hollywood, Pasadena, South Pasadena, Montebello, South Gate, Burbank, Beverly Hills, Inglewood, Rosemead, San Gabriel, San Marino, Culver City, Downey, El Monte, Lynwood, Pico Rivera, Toluca Lake, Universal City, Willowbrook, Compton, La Canada, Montrose, North Hollywood.